Before considering narrative style in the etchings of Rembrandt van Rijn (1606-1669), it’s useful to establish a base of comparison. 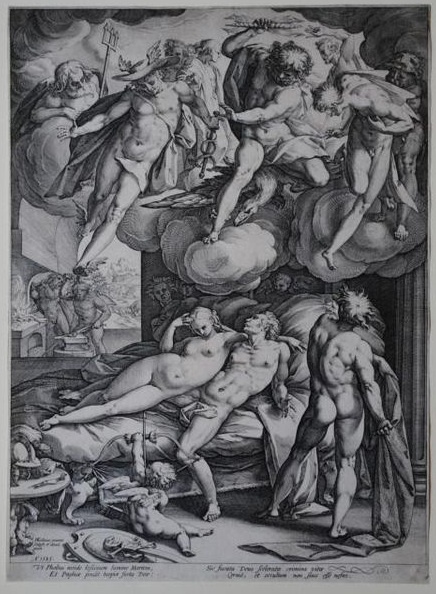 Here we’ll use a piece by Hendrick Goltzius (1558-1617). The point is that Goltzius works out his forms in full, and is consistent throughout the piece: everything he shows, important or not, gets the full treatment. And while style varies from artist to artist, Goltzius’s manner is typical of visual storytelling. How different then is Rembrandt’s “St. 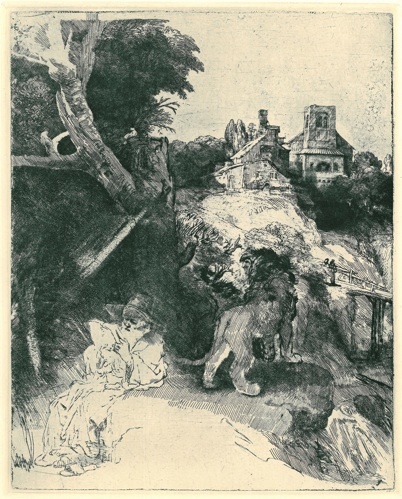 Jerome.” The diagonal swipe of lion and tree is richly worked in tone but irregular in detail: the tree is abandoned at the upper left, and the tone of the lion’s rump and the ground beneath him consists of the frankest sort of parallel lines. Find a similar shadowy form in Goltzius and see how naturalistically he handles it. 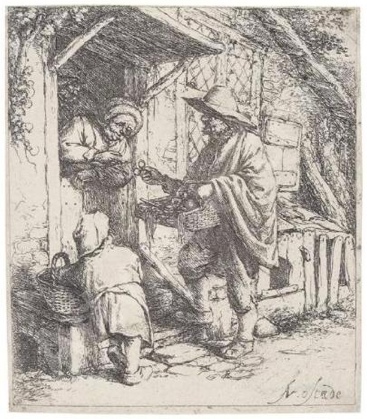 we find seemingly rough and irregular handling in many of Rembrandt’s etchings. In “Abraham” the margins and background are developed while the central figures are described in the most basic lines. And if we look beyond Goltzius’s sort of consistency for narrative reasons for these choices, we have no trouble finding them. The darker margins of “Abraham” frame the direct and dramatic, even harsh, depiction of the central action, which tonal luxuriance would simply muddle. In “St. 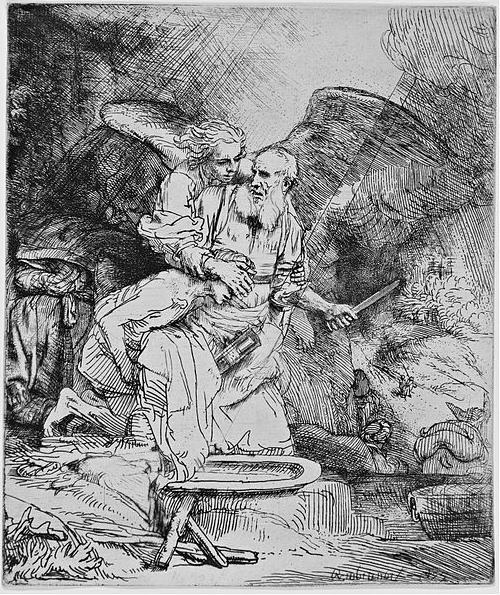 Jerome in the Wilderness” we already know about St. Jerome; what engaged Rembrandt was the wilderness he sinks into, and that powerful, abstract swipe. In each of these pieces, Rembrandt doesn’t fritter away our attention, as Goltzius does, on the elaboration of peripheral details. He has his point to make; he makes it, and then he stops. In “Beggars,” below, the whole right side is untouched. This releases the eye in to the passing of alms. But what would you want to see there? Countryside? Street scene? What would they add? Well, nothing but confusion if we may judge from the very similar piece by Adriaen van Ostade, done at about the same time. 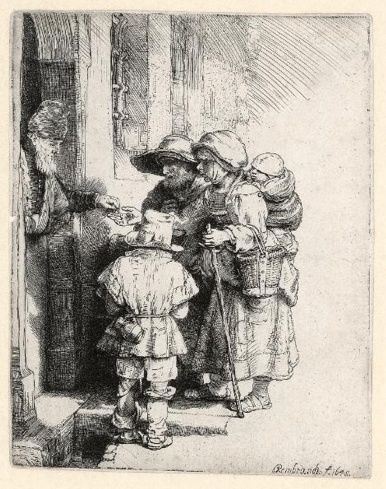 In “The Spectacle Seller” every part of the image–doorway, window, roof and tree bits to the right, figures, baskets– is about as interesting as every other part, whereas Rembrandt focuses on the male beggar’s face and the hands. It’s only if you look around that you notice the many details, which, vivid as they are, don’t compete for attention. Readers of the post of March 30, “Matisse and those old-time devices” will notice in “St. Jerome” another example of the oblique foreground anchored by the distant horizontal.